Our Consumer Place is a resource centre run entirely by people diagnosed with "mental illness" (we choose to call ourselves "consumers"). We provide information, training, support and advice to consumer-developed groups and projects. We also support what we call "consumer perspective" recognising that the lived experience of "mental illness" provides a crucial source of insight that is of value and must be respected. We believe that we are part of an important cultural shift, towards valuing and respecting the lived experience of "mental illness." Those of us diagnosed with "mental illness" have a unique perspective to offer. Our lived experiences are rich and varied: some of us experience madness, psyche-ache, emotional distress, hearing voices, mental breakdown or "mental illness" and we don't all make meaning from our experiences in the same way. Many of us have experienced prejudice, exclusion and trauma. Many have used or survived mental health services, others haven't. Many of us have hidden our experiences, some of us share our experiences in various ways. We all share the ability to reflect on our lives, our communities and the 'mental health system' from the perspective of having been through these experiences. Our Consumer Place is a resource for our voices to come together and become stronger. We are based in West Melbourne (Victoria, Australia). We are funded by the Department of Health (Government of Victoria) and auspiced by Our Community. We are unique in Australia, but there are many similar services in Europe and the United States. Did you know that the first iteration of de- institutionalisation happened in Geel in Belgium in the 14th Century? Or that thousands of Russians were locked up in the Soviet Union with a diagnosis of Sluggish Schizophrenia: poor social adaptation, conflict with authorities and pessimism? Did you know that the 'Moral Therapy' that predated early institutionalisation in the late 18th Century is still understood to have been humane, reasonable and kind? This booklet is a snapshot of the major waves of change through time as new ideas emerged, blossomed and then decayed; as the perception of mental despair turns to brain disease to psyche development and back again - nature, nurture, nature... It is in dot point form with lots of references for people to engage further in areas in which they have an interest. Often organisations, services and bureaucracies call for 'representation' in the advice they get from consumers. This booklet argues that although this representation may be illusionary there are ways to understand the major consumer/survivor narratives that inform the stories that people tell not only about their experiences but also about the state of affairs in mental health provision. It is a short booklet for all who have an interest in understanding why consumer perspective is as it is and why there are storylines which are familiar and accountable. Are consumers coached to say what is wanted by services? Are 'grass-root' consumers sought because they are deemed suggestible? Are the loudest people the only ones who are heard? This booklet asks big questions about what constitutes knowledge and why 'logic and science' so often fails consumers. This book introduces consumers and others dealing with or working in the mental health system, to the presence and workings of all kinds of 'groups' in that system; we examine and offer examples of groups engaging in different types of processes, with different purposes and operating across the many levels on which our health systems 'reproduce' themselves: everyday life and survival, therapeutic experiences, committee work in organisations and programs, advisory and consultative work at different political levels, and in the 'private' and 'public' areas of health service delivery. Many people who live with "mental illness" face complex barriers to meaningful, sustainable employment. Conversely, employing or working with a colleague who has "mental illness" can at times be confusing, frustrating and uncertain (including for people who also have "mental illness"!). This two-headed book has something for everyone. It's quite different from others on the topic of "mental illness" and the workplace. It's not another resource produced by well-meaning charities or experts, telling people with "mental illness" what's good for us (or why working is good for us). It doesn't assume that people with "mental illness" are "sick" while the rest of the workplace is "healthy". We're not interested in giving out patronising advice about the importance of having a positive attitude, getting up early, eating sensibly and taking your medication. Instead, we are offering up a realistic and useful booklet that is grounded in lived experience and willing to delve into the hard stuff. It's been written collaboratively by consumers, so we know from experience what we're talking about. There has also been significant consultation with people who employ consumers and people with expertise in relevant laws and employment practices. Ideally, both consumers and those who work with us will read both sides of the book - and this will lead to true understanding. In fact, we believe that intelligent management of "mental illness" in the workplace can transform work practices to create a more meaningful and sustainable workplace for everyone! The MadQuarry Dictionary came out of a competition asking consumers to enter ideas, concepts, acronyms, phrases and anything connected to the mental health sector that needed light hearted attention from a consumer perspective. We reduced the number of entries down to 350. We then added a little extra consumer mayhem by creating a dictionary style to the document and adding verb, noun, and proper noun etc at random. This will be a challenging document for some who might feel personally attacked. This is not its purpose but we do not shy away from consumer’s right to comment on the mental health system. Consumers are aware that the different clinical groups use humour to critique each other. We have no intention of taking sides. This is our humour and will not be understood by some. See the accompanying information sheet ‘MadQuarry Dictionary - a tool for understanding consumer perspective’. There are also two workshop outlines prepared as a guide to enhance consumers’ use of MadQuarry Dictionary as an educational tool. Every consumer we know has at some time or other been expected to be a meeting-sitter. Some sit on Boards as Directors. Some sit on committees for services. Some make a fine art of it and sit on many committees and others get co-opted with trepidation based on previous experience. All too frequently we are offered training in how to be a good committee wo/man, training that never seems to be offered to anyone else on the committee. This booklet takes a frontal assault on the assumptions implied by this sort of training. This booklet starts from the assumption that it is the committee that needs training in how to respectfully include consumer expertise. Committees might have a lot of learning to do no matter how exalted or how local. It may be that understandings need to be acquired that are quite different from anything some of the external experts have ever been privileged to see before. 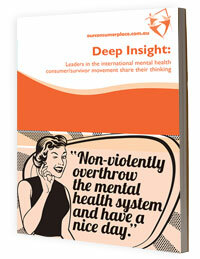 "Deep Insight: Leaders in the International Mental Health Consumer/Survivor Movement share their thinking"
This booklet shares the brilliant and transformative thinking of 11 leaders in the international consumer/survivor movement including Shery Mead, Peter Beresford, Oryx Cohen, Ron Coleman, Mary O'Hagan and many more! Much of this material has been published before in Our Consumer Place newsletters over the years, but we brought it all together into one booklet so you can enjoy a burst of brilliant, inspired and transformative consumer/survivor thinking in one go! It is a veritable smorgasbord! Illustrated with new cartoons from Merinda Epstein, this wonderful resource is now available from our website. We can send hardcopies free to Victorian consumers. We sincerely hope you enjoy it - it has been a labour of love to produce! "So, you've got a 'Mental Illness'? ... What now?" Finally! A resource written by those who have been there. 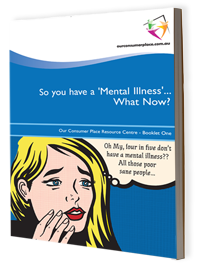 This booklet is an introduction to the mental health system, to "consumer perspective" and to some of the diversity of how consumers respond to a diagnosis of 'mental illness,' written entirely by a team of mental health consumers. Beautifully illustrated with cartoons by batty cartoonist and 2004 HREOC Human Rights Award winner, Merinda Epstein, and punctuated througout with thoughts about madness, creativity, power, language and the human condition, this resource will appeal on many different levels. "Congratulations on a great publication. It is a pleasure to read something that reads so well. You have managed to find a voice that is accessible, sustains itself on the side of the consumer without being in any way shrill or provoking, and at the same time is very informative. I enjoyed reading it, which is a most unusual thing. Why can't all publications in the field of mental health be written in this sort of style. Perhaps the answer is both that it's not all that easy to achieve, as well as that people have been persuaded that managerial styles of writing is what we should be reading."